This Handsalve works great on weathered hands. This natural remedy contains comfrey root and rosemary essential oil, which relieves tired muscles and joints. Proplis, the most "medicinal" beehive product, and aloe vera oil is added to help treat eczema, psoriasis and other skin disorders. 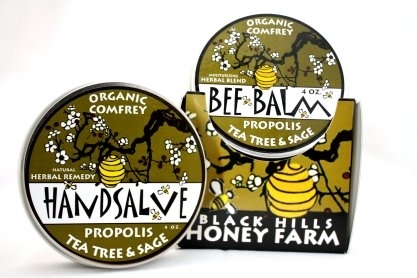 Propolis is antibacterial and antifungal, aids in wound healing, ulcers, tissue regeneration, and reduces inflammation. Aloe vera oil is a renowned skin soother. Patchouli is considered to be one of the best essential oils for rough, cracked skin, while the honey is antibacterial and is a good all-purpose skin conditioner.